If you’ve read our articles on SEO (search engine optimization) for any amount of time, you for sure know we are a big fan of siloing a site. Our recent articles have outlined a classical siloing model which l works incredibly well and remains our defacto method. But lately been experimenting with something we are calling Tensile Silo Structures. it allows you to multi-purpose content that doesn’t have a clear place in a classic silo. it lifts all the important keywords of the site more quickly in search results. More on that later. If you already understand siloing and want to skip ahead to the tensile silo comparison experiment, click Tensile Silo. If you are newer to siloing a website and haven’t read the other articles, just remember that a silo is a grouping of content (aka pages) on a website into areas that make sense to the search engines so that they understand you have a great deal of content around a given topic. Here is the classic Bruce Clay example, one of the founders of the silo method. This leads to better rankings! Unfortunately, a majority of web designers don’t understand SEO and just see it as an after-thought. The SEO implications for a site’s structure should be considered before any design work is done. We can’t tell you how many websites we get to SEO that need nearly gutted in order to be properly structured. There are three ways to build a classic silo, which we’ll discuss below. Use URLs only to indicate the silo structure. Then a blog article that has the URL mysitename.com/keyword-i-want-to-rank-for/blog-title-about-keyword. 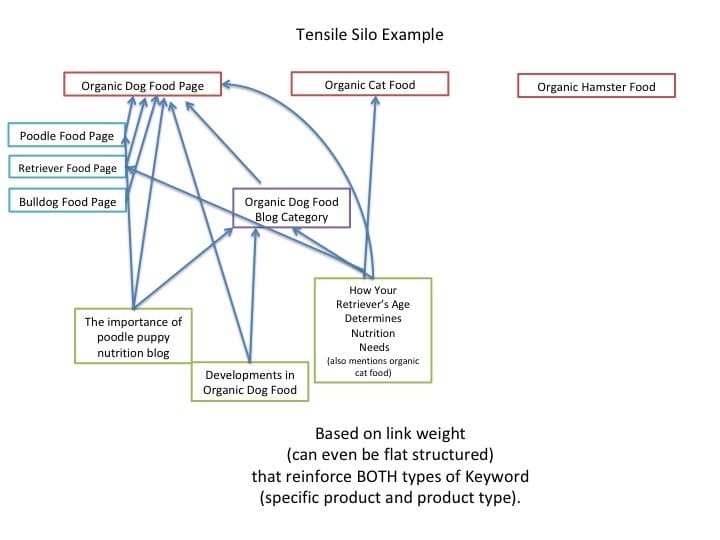 The silo is created by the shared /keyword-i-want-to-rank-for/ structure. This is called a HARD SILO STRUCTURE and while it can work, isn’t ideal. In a virtual silo, the URL structure is thrown out as an SEO concern and all siloing is done with only with links. But strict link protocols are maintained to make sure any article is linked ONLY to a page or another article within this keyword silo. So every page might be mysitename.com/page-name but the links on the page point to the key page above it in the silo. 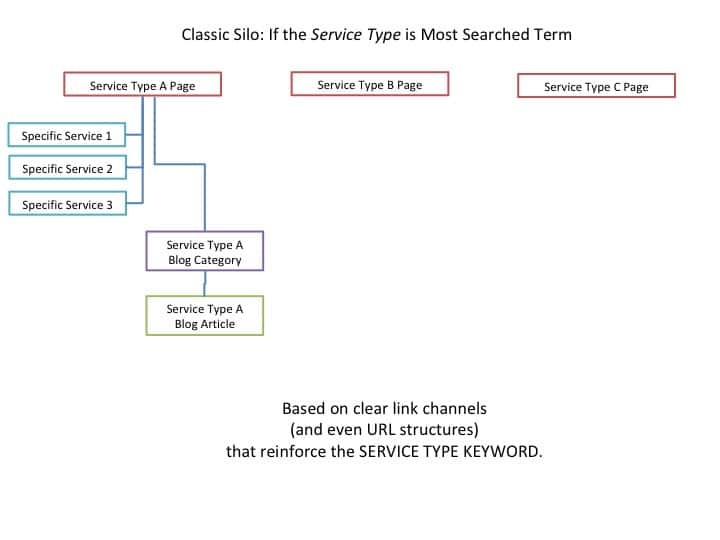 The typical classical silo that we use has both a URL and link structure that reinforces the silo structure. This the best of both worlds. There are also a couple of different strategies based on keyword search volume used to build a classic silo. Keyword research lets us determine search volume. Obviously, we want to be going after rankings on the keywords that get the most searches as it relates to our products or services. 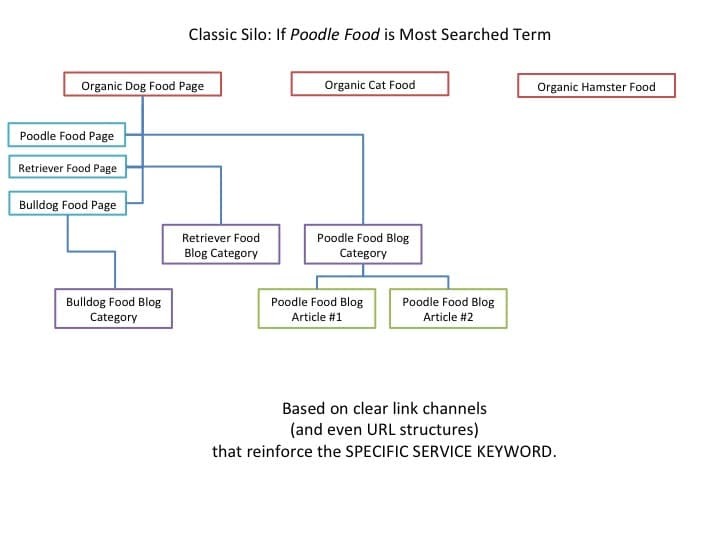 For example, if poodle dog food got more searches or poodle dog food that is organic, we’d want to build the silo as follows (click image to enlarge). What drove this experiment was a website for a large international corporation in which we were asked to Pre-SEO strategize, design, develop, and provide ongoing SEO for the site. The challenge arose in that information on the site needed to be grouped in a way that classical silos made extremely difficult. The company has a large Press Room section and gets numerous magazine features of their products which reporters and industry leaders access. Yet these Press Releases talked about product lines and product names which could greatly aid the rankings on those terms. Most of the time, the press release or magazine features talk about multiple product lines or product names. Those pieces didn’t fit neatly into Classic Silo structure, because we would have needed to assign each piece of content to one, and only one, silo. So we decided, with their permission, of course, to do an experiment. We developed a strategy and coined a name: Tensile siloing. 2.capable of being drawn out or stretched. A tensile structure is one that is supported by the tension of cables or other materials. Think of a suspension bridge with lots of cables that are stretched. 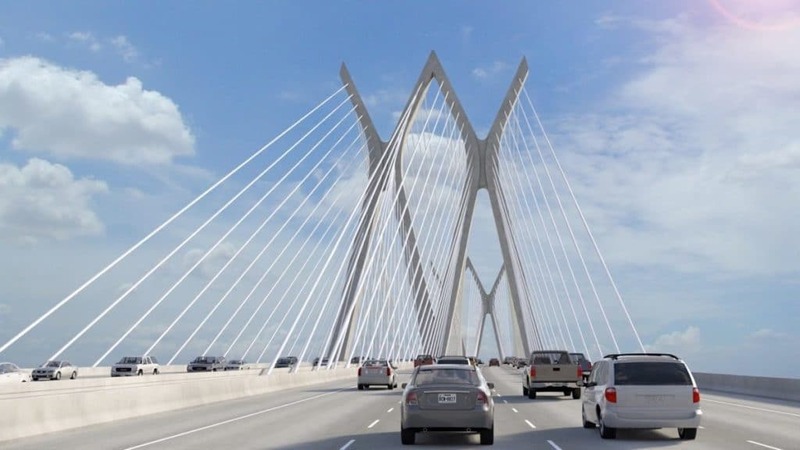 If the bridge needs to be enlarged, more cables are added. 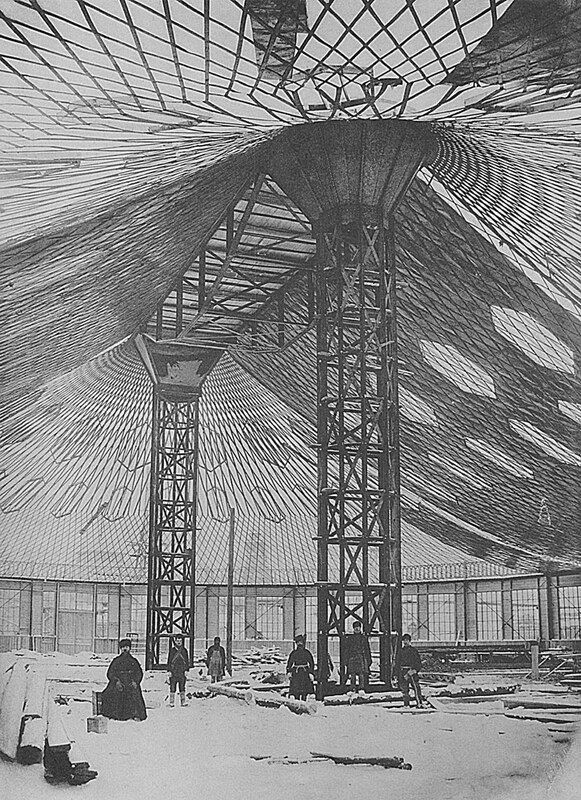 Or here is a picture of the first-ever tensile structure built in Russia from 1895. See how all the cables support the structure? Each link carries the tensile weight of that new piece of content and directs its SEO value where it needs to go. In a Tensile silo structure, a piece of content’s SEO value can be directed to more than one place. The “more-than-one-place” concept” is a big no-no in the Classical Silo. 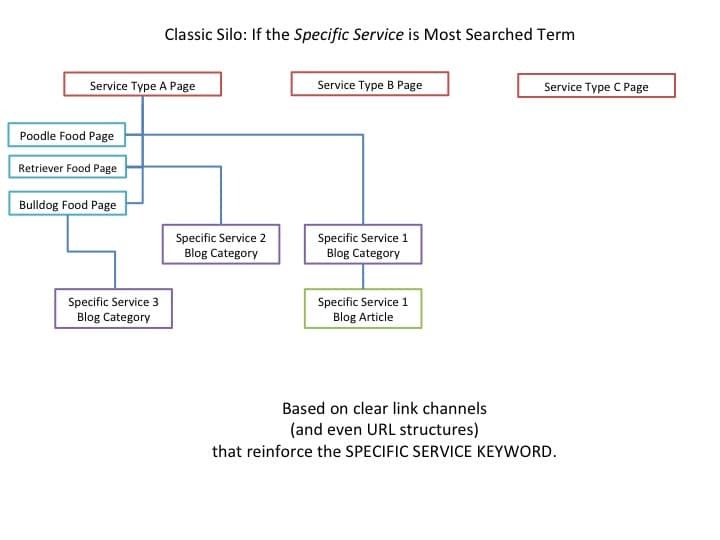 You only want to attach the SEO cable up one level in Classical silos. With this structure, lots of site fluidity is allowed in regards to what role each piece of content plays. Here is an example of the previous model done with Tensile Siloing (click image to enlarge). As you can see, each piece of content is providing a tensile link to more than one point. An individual blog article might link to the product/service type page AND the product name page AND the blog category. These product pages also link up to the product type page. The blog category archive also points up to the product type page. So how do the search engines know what the most important keyword is? And which page is given the priority in search ranking? We know that search AI is getting smarter and smarter. And based upon our experiment, we are hypothesizing Google will clearly ascribe search value by how much link weight is applied to each page. You can clearly see in the example diagram which pages, and thus keyword terms, are receiving the most tensioned weight. 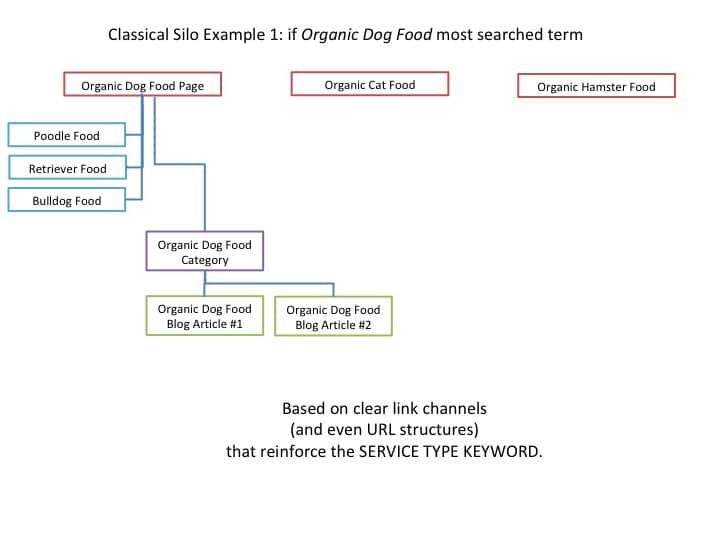 Organic Dog Food is heavily linked, thus the site will both rank for this term and this page will be the ranking page based on link weight. As more poodle articles are written and placed, both poodle food and organic dog food will get more links and increase the tensile strength of each. And this weight can be pointed and adjusted much more easily than in a Classical Silo. How is the Tensile Structure different than the Classic Virtual Silo? While you use links to build BOTH types, the simple answer is because of the number of places each piece of content can link to in a tensile silo. In a Classical virtual silo, you really want each piece of content linking to only the element immediately above it. In a Tensile silo, each piece of content can link to multiple places across the site (within, reason of course). 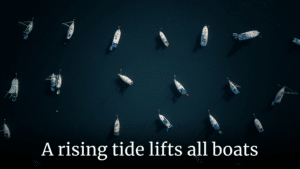 The benefit of this strategy is that this method of SEO siloing might be the best way to see the expression “a rising tide lifts all boats” come true. Because there is a massive web of interlinking, one successful blog article appears to spread the SEO more generously throughout the site. Our experiments are showing a broader rise in all the keywords/pages that the article points to verses in the Classical model, where the pages immediately above that article get the chief reward. It’s as if the whole site is rising with the tide in a more direct correlation than in Classical siloing. Sometimes, as in the case that drove this experiment, content doesn’t fit neatly in a single silo. 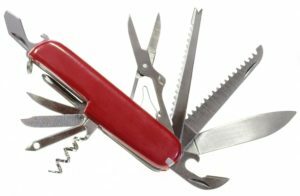 At other times, we want to multi-purpose it. In addition, if an entirely new product type is developed that brings some of the previous products into it, the whole site structure doesn’t have to be redone. This also reduces possible duplicate content. In a Classic Silo, the Vegan Dog Food line would then need its own Pood Food page, which if not careful, could too closely mimic the Organic Dog Food‘s poodle food page. With the Tensile structure of web silos, this is irrelevant as the same Poodle food page serves both types. The site we restructured using the Tensile SEO method saw an average weekly traffic jump from around 3,000 unique visitors per week to 15,000 unique visitors per week. Traffic wise, that is definitely a success of 5x the amount of weekly unique visitors. In addition, we are seeing the keywords we most need to rise climbing at the same rate or better as we would in a Classical Silo Structure. And more of the related keywords are rising at a rate 14% faster than in a Classical Silo. Note, we still employ the Classical Silo structure for the majority of our clients but will keep experimenting and let you know the results of the Tensile Siloing method from our SEO labs filled with mad scientists. Stay Tuned and feel free to ask questions in the comments below.